We are indeed delighted to present 441 extraordinary managers at the PIM’s latest convocation. They have been developed as leaders with global presence and local pulse. That’s why we picked the apt theme this year as ‘unleashing the power to lead’. Instead of cursing the darkness of leadership we see at the political fronts, we decided to light not one candle but many. Today’s column is all about this prestigious event of the premier postgraduate enterprise that aptly acclaimed as the “Nation’s Management Mentor”. As we are much aware, leadership is all about inspiring, influencing and initiating. It is more than positions and titles as it involves decisions and actions. We have been breeding leaders to the nation for over 30 years. These thoroughbred professionals have mastered value creation with confidence and competence. They are equipped with cutting-edge knowledge and complementary skills needed to perform in both private and public sectors alike. In producing them with clarity and commitment, the PIM has always been a centre of excellence in management education with its wings spreading beyond Sri Lanka. Excellence is all about being exceptionally good. When applied to enterprises, it involves exceptional achievements in a consistent manner. That’s what the PIM is proud of as a self-financed and semi-autonomous public entity. We simply excel with extraordinary executives in essentially engaging them to unleash their true potential. The nation expects them to contribute towards the socio-economic upliftment in multiple fronts. As our mission proclaims, we ignite human imagination by developing leaders with global presence and local pulse. In this endeavour, we pursue innovative teaching, cutting-edge research, enriching partnerships, inspiring sustainability and exemplary governance. Now the time has come to expand our reach, regionally and globally in adhering to best practices with appropriate use of technology. The PIM will continue to produce value in practicing values, as the nation’s management mentor. 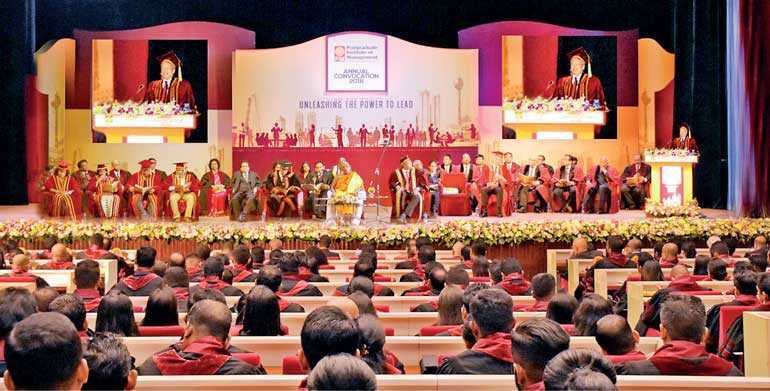 Jan Kunigk, the Executive Vice President of Siam City Cement PLC and the Director Marketing, Sales and Innovation at Siam City Cement Lanka Ltd. was the keynote speaker of the PIM’s annual convocation this year. Currently Kunigk is leading the Sales, Marketing and Innovation departments for Siam City Cement in Sri Lanka and is part of the Thailand based Corporate Sales and Marketing Excellence Circle and a member of its Digital Council. Siam City Cement is the fastest growing cement and construction materials company in Asia with current revenues of close to $ 2 billion, 6000 own employees and assets in India, Indonesia, Bangladesh, Cambodia, Vietnam, Myanmar and Indonesia. Kunigk is an independent advisor to several European, US and Singapore based institutional investment companies and has served in various top management and senior management positions before joining Siam City Cement. He served as Commercial Director of Holcim Indonesia, a publicly traded company since January 2013, generating revenues of Swiss Franc 1 billion. Kunigk was responsible for all sales and marketing activities and lead the transformational and change management program from a product-centric to a customer-centric and customer-focused organisation, changing the mindset of over 2,500 employees. He holds a Master degree in Business Administration (MBA) from Western Illinois University (USA) and a Diploma in European Business Studies of Bamberg University (Germany). He continuously focuses on executive education to stay up to date and joined programs at Harvard University, Boston, Massachusetts, Chicago Graduate School of Business, and at IMD, Lausanne, Switzerland. “You have all the thinking in your hands by now. You are ready to excel and launch. With that, I wish you the very best for your future, in developing your legacies, and with that all the best for your future endeavours”. That’s how Jan Kunigk concluded. As Aristotle said, roots of education are bitter but the fruits are sweet. The convocation day was a time of tasting that sweetness. A premier postgraduate program should have high quality and relevance. That’s what we at PIM are continuously striving for. I earnestly hope that the 441 private sector managers and the public sector administrators who graduated will contribute their utmost towards the betterment of themselves, their respective organisations, and the nation at large. That’s how we unleash the power of leadership in breeding holistic leaders fulfilling a dire need.